The Seven Wonders of the Ancient World were originally listed by Herodotus, revealing the greatest constructions of classical antiquity, in order to offer a unique guidebook for sightseeing, extremely popular amongst the Ancient Hellenic travelers. Amongst the Seven Wonders of the World, appears the Statue of the king of Gods, Zeus, in Ancient Olympia. Ancient Olympia, located in the Peloponnese, was the city where Greeks originally celebrated the Olympic Games that started in 776 B.C., in order to honor Zeus. 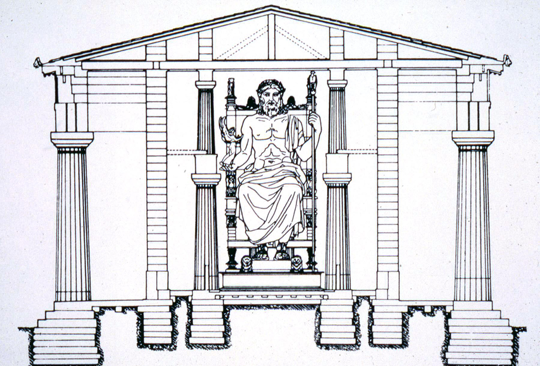 Approximately between 466 BC and 456 BC, the Temple of Zeus was constructed by the Greek architect Libon, according to the classical Doric style, but was judged insufficient to honor Zeus, the king of Gods. It was then decided to create a statue of Zeus that would reside in the temple, The Statue of Zeus, which would lately become one of the 7 Wonders of the World. This incredible statue, one of the most famous works of art history, was the masterpiece of a great sculptor, Phidias, the creator of the Goddess Athena statue in the Parthenon. 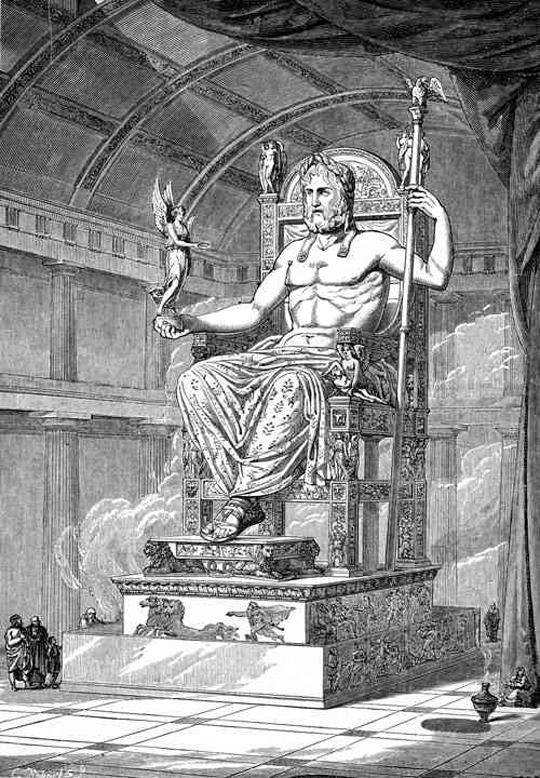 The statue, which was 12 meters tall and occupied, according to Herodotus, a whole room at the western part of the temple, represented Zeus seated on an elaborate throne and was made of ivory and gold, in the most representative classical style. Since no copies of the statue exists, its exact shape has never been confirmed, though Pausanias, a Greek traveler and geographer of the 2nd century AD, made a detailed description of the statue and its throne. According to his description, the statue’s figure, which was settled on a throne made of cedar wood, gold, ebony, ivory and precious stones, was made of ivory and Zeus’ beard, hair and robe were made of gold. The statue’s right hand held “Nike”, the figure of Victory, also made with ivory and gold. Its left hand held his scepter perched by an eagle and made of precious metals. It is believed that, since the weather at Olympia was very humid, the statue required great care with oil so that the ivory wouldn’t crack and was constantly treated by Phidias himself and his descendents, over the centuries. The Statue of Zeus stayed at the temple in Olympia until 392 A.D., when Roman emperor Theodosisus I decided to abolish the Olympic Games believing it represented a pagan rite. What happened to the great statue after that remains unclear; according to historian Georgios Kedrenos, wealthy Greeks carried the statue to Constantinople and was destructed during a great fire in 462 A.D. The temple of Zeus itself, after many years of natural disasters, was completely damaged by a fire occurring in the fifth century AD. Since then, many archeological excavations saw the light, revealing many hidden remains of the temple and the statue of Zeus. Amongst them, a group of French archeologists discovered in 1829 the outlines of the temple and fragments of the temple and shipped them to Paris where they still can be visible at the Musée du Louvre. Another expedition, headed by Germans in 1875 was able to map the whole temple and discovered more remains of the temple. Finally, between 1954 and 1958, archeological excavations revealed many tools and terracotta molds, bearing the inscription “I belong to Phidias”, objects that were studied by scientists who confirmed the date of the Statue of Zeus’ creation. Today in Olympia, the Olympic Games Stadium and the site where the temple was located have been restored, including only few columns left of the temple. But even if today, nothing is left from this unique wonder of the World, the statue of Zeus has represented since, the greatest source of art inspiration and remains one of the most exceptional masterpieces of Art History. Very nice text & pictures.